I previously mentioned my love for the Extra Hot Great Podcast in my post about podcasts. As of this week, in addition to their regular weekly podcast they are now starting to do daily mini-podcasts under 4 minutes each. That alone is making me happy because it’s a quick, fun EHG fix during my work day. However, what is really making me happy is today’s EHG Mini, which is entirely composed of clips of people whistling in pop culture. It wasn’t really designed as a trivia game, but make it one for yourself. Listen and figure out if you can identify where all the whistling is coming from (answers are posted in the comments). More importantly though just have fun listening to all whistling. If you can keep yourself from whistling along you’re a stronger person than I.
I love the movie Labyrinth. I have probably watched it a hundred times since I was a little kid. The whole movie is wonderful, but I have always had great affection for the soundtrack. Thus my heart did a little happy dance when I stumbled upon this delightful little a cappella version of Magic Dance. I hope it brings a little joy to your day too. You know what this blog needs…more cute cat pictures and videos. Just kidding. Sort of. In my previous post about my cats I mentioned that my cat Scout loves canvas bags. You can witness her joy in the super cute video below. By the way, she found the bag in the video in our basement and got the straps wrapped around her and trotted upstairs wearing it. Too bad I don’t have a video of that. Yesterday I helped host a baby shower for my friend Katie. You would think based on what is about to appear in this post that I am one of those super creative and crafty people. You would be totally wrong, but for some reason this baby shower brought out my creative side. 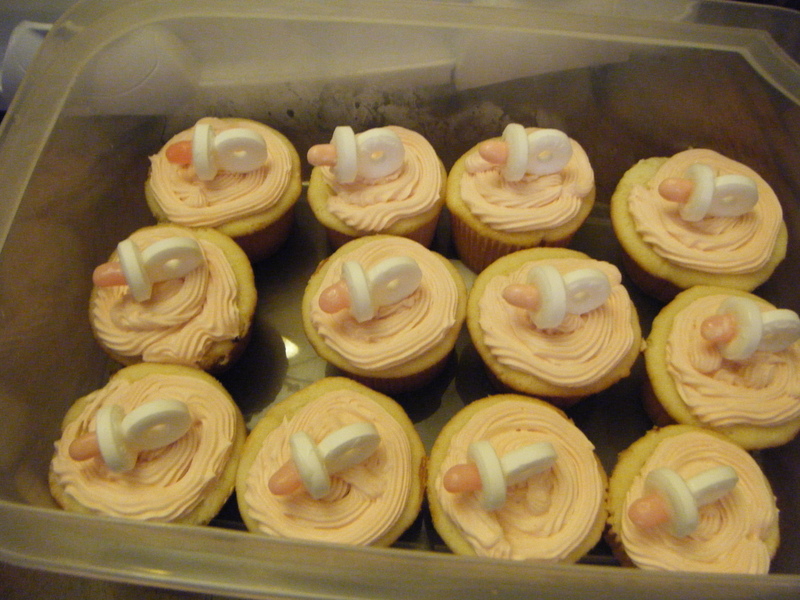 I was in charge of making cupcakes for the shower, so I decided to make a dozen vanilla cupcakes and dozen chocolate cupcakes decorated differently, but both in keeping with something about the baby. Katie is having a little girl, so I decorated the vanilla cupcakes with pink buttercream icing and little pacifiers that I assembled out of lifesavers and jelly bellys. 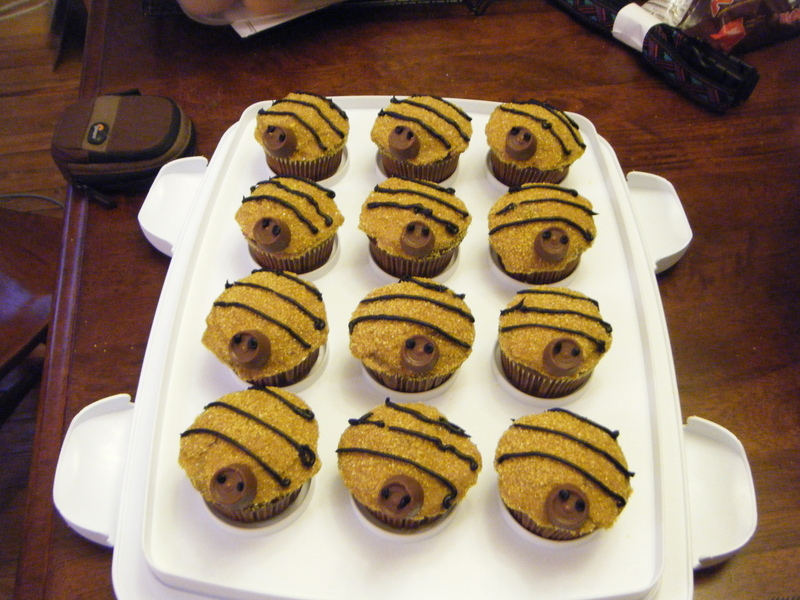 The baby’s nursery has a bumblebee theme, so I decided to decorate the chocolate cupcakes as bumblebees. I was going to make antenna out of string black licorice, but I couldn’t find any and didn’t see anything else that would work either. So my poor bees had to go antennaless. 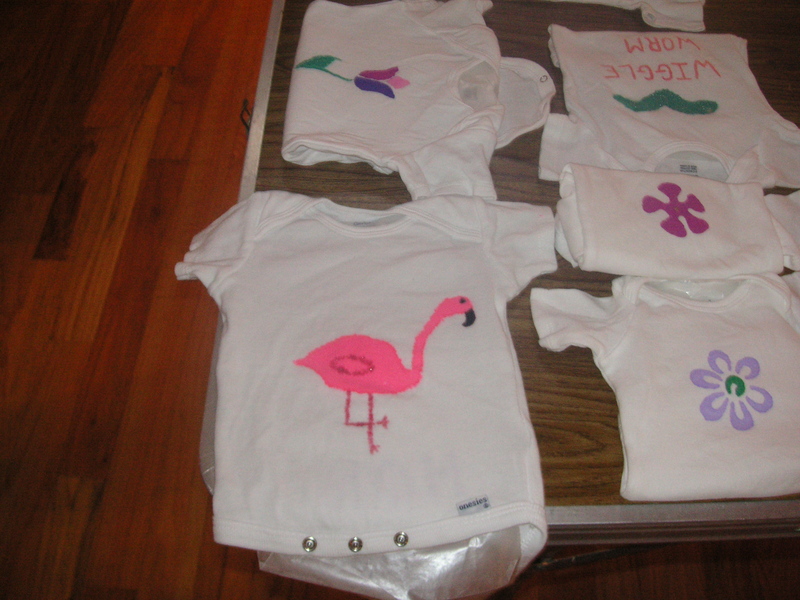 One of the activities we had planed for the baby shower was to decorate onesies for the baby to wear. They all came out super cute, but I’ll only bore you with pictures of the ones I made. The first one I made completely using stencils, so although it’s cute I don’t feel that much pride in it. The second one however, I am super pleased with because I drew it all by hand. As someone who can barely draw stick figures, I am super excited about how well it came out. It’s Baby’s First HonFest onesie. If you’re familiar with Baltimore, especially my neighborhood Hampden, you’ll totally get this onesie. If you don’t know anything about Baltimore and Hons, this will make no sense to you but I don’t feel like explaining it so sorry you’ll just remain confused. Or Google it.